NEW DELHI -- South Korean President Moon Jae-in arrived in India on Sunday for a state visit that will include a bilateral summit with Indian Prime Minister Narendra Modi on ways to further improve their countries’ relationship. 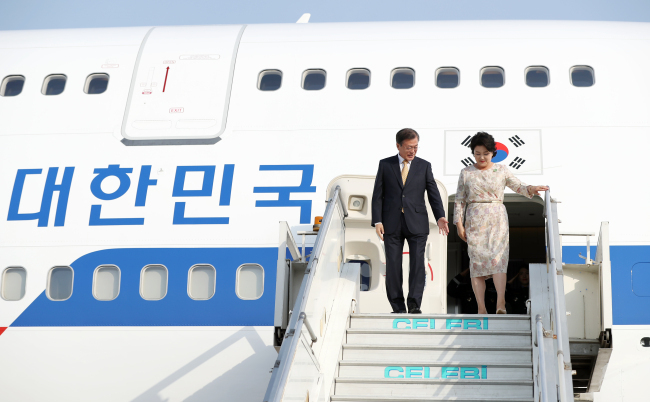 The South Korean president left his home country earlier in the day on a two-nation trip that will later take him to Singapore. His trip to India marks the first of its kind since he took office in May 2017. Moon‘s visit to India comes at an invitation from the Indian prime minister, who was one of the few global leaders to congratulate Moon on his election last year in the Korean language, delivering the message via SNS. The Moon-Modi summit, to be held Tuesday, will mark the second of its kind as the leaders first met on the sidelines of the Group of 20 summit held in Germany last year. “We expect the trip to be an important opportunity to strengthen friendship and trust between the leaders and to create a basis for the development of our country‘s complementary and mutually beneficial cooperation with India and Singapore to establish future-oriented and strategic relations with the countries,” Nam Gwan-pyo, a senior director of the presidential National Security Office, said. During his four-day stay, the South Korean president is scheduled to visit the new production facility of Samsung Electronics, currently the largest smartphone supplier in India, according to the presidential office Cheong Wa Dae. He will also hold a meeting with Indian President Ram Nath Kovind and attend a joint business forum. He will leave India on Wednesday to head for Singapore, where he will stay for a three-day state visit. There, he will meet Singaporean President Halimah Yacob and hold a bilateral summit with Prime Minister Lee Hsien Loong, according to Cheong Wa Dae. “Through his meeting with the president of Singapore and talks with the prime minister, President Moon will evaluate the results of cooperation between the two countries so far and discuss ways to enable future-oriented cooperation between the two countries based on such progress,” the Cheong Wa Dae spokesman said. President Moon will also offer a special lecture for Singapore’s top opinion leaders on Seoul‘s efforts to denuclearize North Korea and establish lasting peace on the Korean Peninsula. With his trip to Singapore, he will have visited four out of the 10 ASEAN countries following his trips to Indonesia, the Philippines and Vietnam.